What Is DA Form 5789? 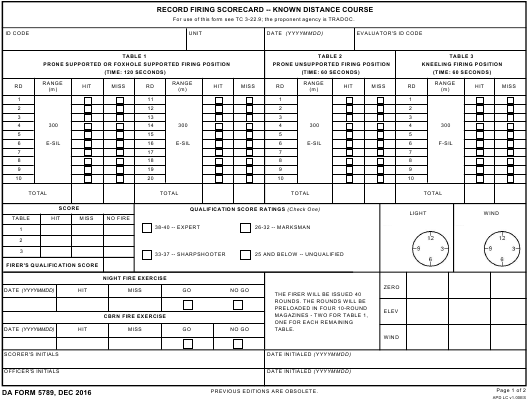 DA Form 5789, Record Fire Scorecard - Known Distance Course is a form used to record firing scores during Known Distance (KD) range courses - one of the two Army-authorized alternate record fire courses. The newest version of the scorecard - sometimes confused with the DD Form 5789 - was released by the Department of the Army (DA) in December 2016. An up-to-date fillable version of the form is available for digital filing and download below or can be found through the Army Publishing Directorate website. Practicing firing tight shot groups at known distances. Overcoming the effects of gravity and wind while making sight adjustments at the range. How To File Da Form 5789? For use of this form see TC 3-22.9; the proponent agency is TRADOC. the standard record fire course is not available. within or touches some part of the silhouette facing. available). No other armor is required. (1) Table 1 -- Prone supported or foxhole supported firing position. 300 yards within 120 seconds. (2) Table 2 -- Prone unsupported firing position. (3) Table 3 -- Kneeling firing position. The top line of the form requires the soldiers' ID code, their unit, the date of the exercise and the ID of the scorer. Table 1 requires the results of shooting from a prone supported or foxhole supported firing position. For this test, the firer is given two 10-round magazines to engage an E-silhouette at 300 yards within 120 seconds. The table consists of four columns: number of the round, the range, the number of hits and misses, and the total score. Table 2 is for recording the results of firing from a prone unsupported position. The range is 200 seconds and the allowed time is 60 seconds. Table 3 is for recording the shots fired from a kneeling position. The range for this exercise is 100 yards and the available time is 60 seconds. The digital form automatically calculates the final score and the overall results of the shooter. The scorer has to specify the directions of light and wind in the box with the two blank hour-plates. DA Form 5790, Record Firing Scorecard - Scaled Target Alternate Course is a form used for recording scores during alternate qualification courses. DA Form 3595, Record Fire Scorecard is a form for recording a soldier's overall shooting skills.